First-ever Pin Mate™ set celebrating Captain American and Iron Man from movie Captain America: Civil War. Numbers 1 & 2 in the series for true collectibility. Who will you follow when good divides into two sides? Well with the Captain America: Civil War Captain America vs. Iron Man Pin Mate Set of 2 from Bif Bang Pow!, you don't have to choose. 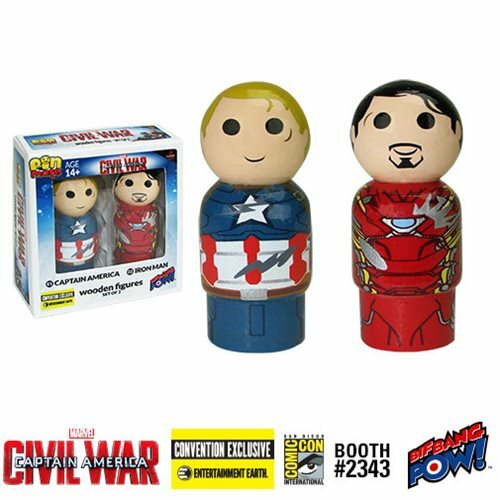 Designed in a retro-style, these 2 miniature wooden figures are designed with intricate 360-degree artwork that includes hand-painted details alongside limited decals, which showcase Steve Rogers and Tony Stark in their battle costumes.